If the expression of emotion is essential to the experience itself, then perhaps Hidden in Plain View have found the appropriate manner for the sort of feelings their musical genre is so infamous for. As our body functions, so does our emotional functionality – as in the way our body reacts during the emotion makes for a great deal of the emotion itself. Yet as many young emo-derived rock/punk bands have apparently shown, emotional potency is achieved only from the exaggerated flailing on stage (yes you doing backflips while swirling your mic during mid-song spazzing out) and the chronic screaming on tape. It certainly makes for raucous performances and the record will definitely increase sales of aspirin but it seems they’re missing the point. Intensity is not who sings the loudest; it is not who is most crazy live, but rather who is most effective in causing another person’s body to react in such a way that they feel the one shared underlining emotion of a certain place and time. 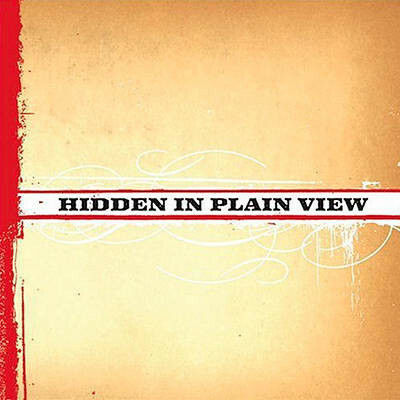 So what is the difference between Hidden in Plain View and the host of generic, pseudo-affecting, overbearing emo bands that have risen like the great plague in recent years (I’m pointing my finger at YOU Matchbook Romance)? Well perhaps it has a lot to do with this EP itself, a brief five songs that lessen the burden of egregious self-reflection and poetic attempts at social/economic commentary. I am not a scholar but for one am sure that people who have yet to study high level psychology and human behavior (if the members of HIPV are psychology graduates, please feel free to correct me) cannot simply dismiss the pain, the hurt and the suffering and confusion as the result of ‘YOU.’ Who is ‘You’? When Thrice bellow “You think they’re selling you truth / truth is they’re selling you out”, who are they talking about? When Finch sings “Do you notice I’m gone? / Where do you run to so far away?” are they talking about the critic who ran for the hills upon listening to their work? Perhaps the biggest problem with this here little scene is its reluctance to move the emotion from the loneliness of one’s bedroom to the seemingly vast loneliness of the world. And while Hidden in Plain View escapes not from these shades, there are moments where they actually turn the feeling into something worth sharing. In “Where The Highways End”, the surrounding musical backdrop of sweeping melodies, sweetly sugared rock and its emphasis on “we” is far from the reclusive nature of this very dreary musical view. The heartland-like lyrics (“its 6am, open roads and open skies / under this Wyoming sunrise”) and pretense-free disposition makes it the EP’s strongest offering. It is however followed by a real turd of a song that makes play for everything bad about this sort of music – just an example of how it can so easily shift. Yet as most of the EP goes, it is far better than the music of many of their peers. Is Hidden in Plain View essential? Not by any means, but when the rest of the herd are scraping the bottom of the barrel, Hidden in Plain View see distinct timbre in reaching outside their “defined” constructs. Perhaps it is the nature of a short release – to try and squeeze in everything that is good in condensed time – that has thankfully forced them to cut away the fat so to speak. Maybe their genre needs to give them a little more credit (or maybe we should restrict all emo bands to no more than five songs on any given release) because from where I’m listening, they’re one of the few who do this sort of thing with enough fervency to last the long, cold winter.